Casually, while our family was out and about on a summer Saturday afternoon managing our weekend errands, my son gave me a wake-up call. "Mom, can we buy shaving cream?" Yup. My teen was ready for his first shave. With three kids and so much on my mind, I was caught sleeping with my eyes wide open. The proud arrival of his peach fuzz graduated to preparations for his first (kinda) real shave. Having been advised by a close friend about the detrimental effects of helicopter parenting, I make every effort to allow time and space for my kids to gain life experience when appropriate. I obliged his request, prepared him with all of the essentials, and allowed him the time and space. 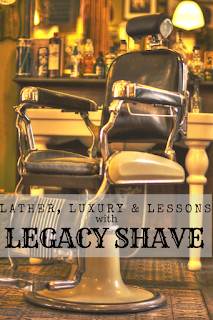 My son learned, as I silently observed lather, luxury, and life lessons with Legacy Shave. Thank you to the team from Legacy Shave for the courtesy of providing promotional product for editorial content purposes. Narrowly dodging the helicopter mom status, I totally own up to being extra as a mom. Watching my son shave is definitely a milestone moment in parenting, however I wanted to bring a little something extra to the occasion. That's where Legacy Shave made all of the difference. There's no advanced technological breakthrough needed when it comes to lathering and shaving, in fact, moving toward the opposite direction best enhances the tradition of the shaving experience. 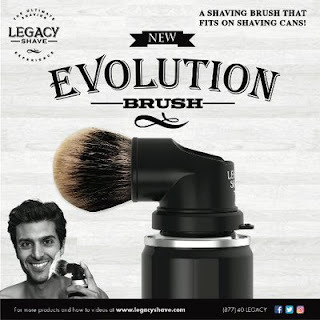 Legacy Shave uniquely transports the comfort and luxury of old-fashioned barber shop shaving experience into modern day homes. The Evolution Brush inventively combines the barber shop shaving brush experience with standard shaving cream and gel cans. As a nostalgic tribute to their father, Steve and Dan, the two founding brothers incorporate "what is closest to our hearts and that is family and legacy." With many facets of life, I've learned the life lesson that in order to know where you are going, it is important to know from where you came. The Evolution Brush shows the evolution in shaving reminiscent of the golden age of shaving. Knowing that my son sees the value in taking his time carefully shaving from ear to mouth, with The Evolution Brush stimulating and lifting hair follicles for a clean, close shave is reassuring. Not to mention the fact that he's using less shaving cream and making less of a mess with The Evolution Brush is a money-saving and time-saving bonus. Enjoy Lather, Luxury, and Life Lessons with Legacy Shave.